Lenovo is best known for its ThinkPad laptops and newly acquired phone business, but the Chinese firm started making TVs a couple years ago, too. And now, it's the first one to build a set utilizing NVIDIA's new Tegra K1 chip. It's that super-powered silicon that explains the TV's presence at GTC 2014, so naturally, we had to spend some time with it while we were at the show. Called the Terminator S9, it's a 50-inch 4K smart TV that runs a Lenovo-skinned version of Android 4.2 natively, but the real magic happens courtesy of a small plug-in module round the back called a Smart Card. It's roughly the size of a deck of cards (though half as thick), with a micro USB port and microSD slot on one end and a proprietary 70-pin connector on the other. That connector is how it plugs into the TV, while the USB and SD ports are for adding storage or connecting peripherals. Within the Smart Card's relatively bland exterior lies the aforementioned Tegra K1, and other hardware (currently unknown) needed to run Android 4.4. All Lenovo smart TVs moving forward will ship with a 70-pin port built in, but only higher-end models will come with Smart Card hardware. 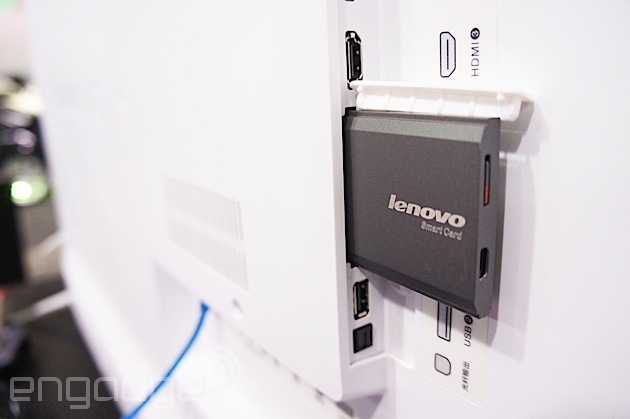 That means the Smart Card is a way for Lenovo -- and any other OEM who licenses the tech -- to keep customers running the latest and greatest software and hardware on their TVs. The Smart Card comes with a slick motion Bluetooth remote that has a pair of physical buttons: a red power button at the end and a spun metal voice control key in the middle, plus a circular touchpad located in a thumb friendly location. Navigation works using gesture control (a la LG's Magic remote) to make selections, while swiping left and right on the touchpad scrolls through the menus. And, you adjust the volume via touchpad using the Seinfeld/Costanza special: clockwise or counter-clockwise swirl gesture. It's simple and intuitive to use, and the remote's shape and soft touch finish make it a pleasure to fondle. 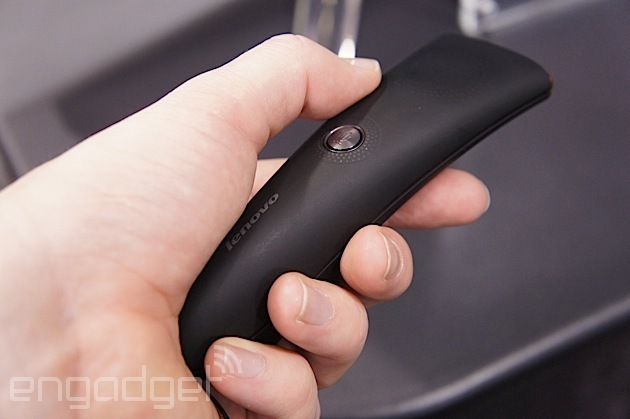 Ready to plunk down your hard earned cash for Lenovo's new TV system? Unless you call China home, alas, you don't have the option to do so -- though Lenovo's looking at expanding to other regions should the Chinese market returns supply sufficient incentive to do so. Regardless, for those in the Far East, the Terminator S9 will set you back around 6,000RMB ($970), while the Smart Card costs less than 1,000RMB ($160).